[Blind Gossip] It should be an interesting month for this celebrity couple! They have been together for more than a year. They both love publicity. She thinks he will be proposing to her during this holiday season. He, on the other hand, may be proposing that she slow her roll! He loves publicity, too, but the constant emphasis on getting engaged is irritating to him for some reason. He just wants her to back off and let him do what he wants to do when he wants to do it without her pushing him. We honestly don’t know which way this is going to go. She is rather dominant in this relationship and has been teasing the whole ring issue, so it’s going to be hard for him to get out of this one. [Optional] What do you think he is going to do? [Optional] Unless he get a rock solid prenup he wont marry her. Jennifer Lopez and her flavor of the year. 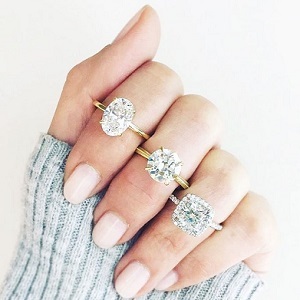 How many engagement rings does one need? JLo… she’s been married 3 times; hence the 3 rings? He’ll cave…maybe not by Christmas, but he’ll cave. Jennifer and Alex. Who knows what will happen? Maybe he’ll cheat on her. Maybe he’ll give her a ring but the wedding will never happen. He’s an amateur at fame compared to her. He signed up for the A list, he needs to play the game. She understands that them as a dating couple is not as valuable as a married couple… she also understands that they have a limited window of being an “it” couple, until someone else steps in, and engagement and then marriage will prolong their value. How does he not get it? How does he think this is about him? It’s about their brand, pathetic as that is to say.